Cakes are much more special. But this cake, is really really special. 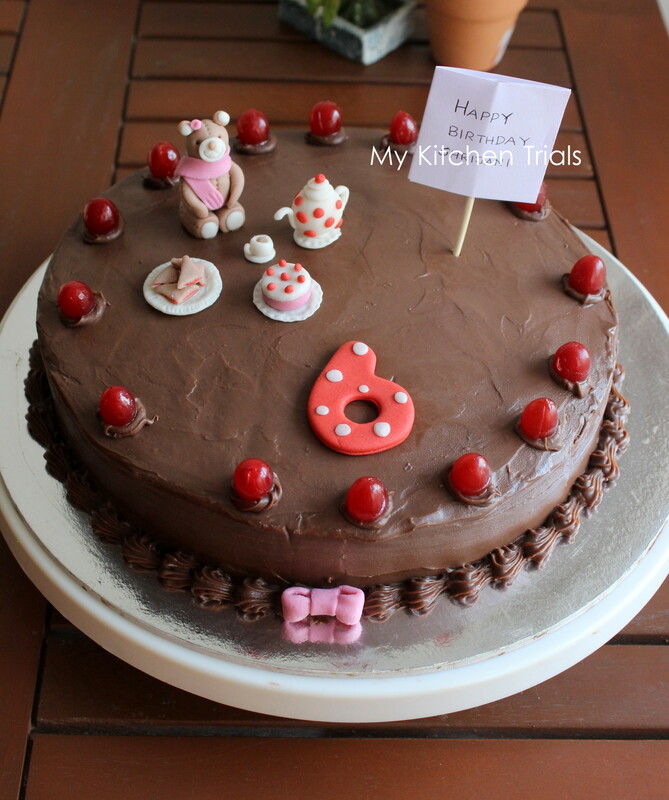 It was baked for a 6-year-old with the sweetest smile ever! And it is the first (and only) order I have taken. The mother gave me a free hand. An egg-less cake to feed 10 kids was what she wanted. So a chocolate cake with chocolate ganache was what I zeroed on. And some fondant topper, of course!! I made a small pink bow, used a cookie cutter to write ‘6’ and made a teddy… all set for her party…with a cake and tea-pot and some sandwiches. 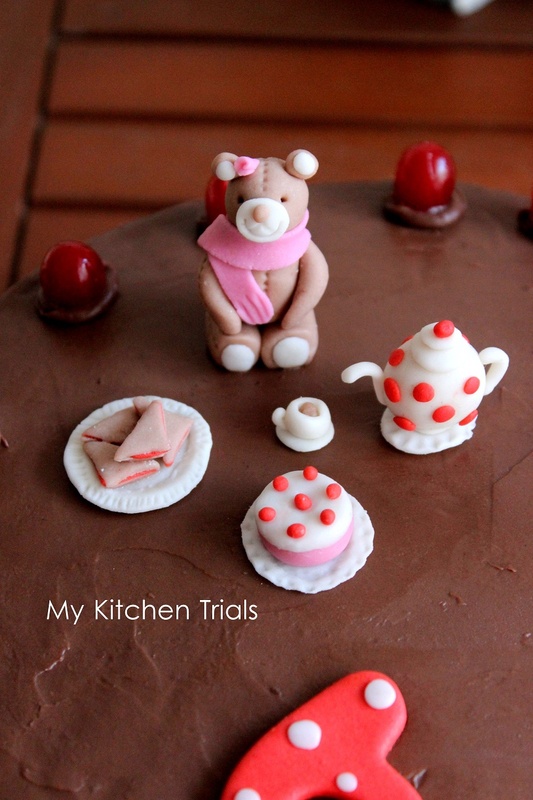 I wanted the teddy to sit in a carpet in the middle of the cake, but somehow ended up doing this way. I didn’t want to write on the cake, so went ahead with a birthday note stuck to a skewer. Chop the chocolate into even sized small bits. The chocolate should be at room temperature for this. Transfer the chopped chocolate to a microwave safe bowl. Add the cream to it. Microwave for 30 sec and take out. Give it a good stir. Microwave for another 30 sec and again, take out and stir. Microwave power varies and so, after stirring if it’s still not come together (it will be like melted chocolate), give it another 10 or 20 seconds. It took only one minute in mine. Once all the chocolate has melted and you have your rich ganache in your bowl, leave it aside for a couple of hours at least. You can leave it overnight as well. 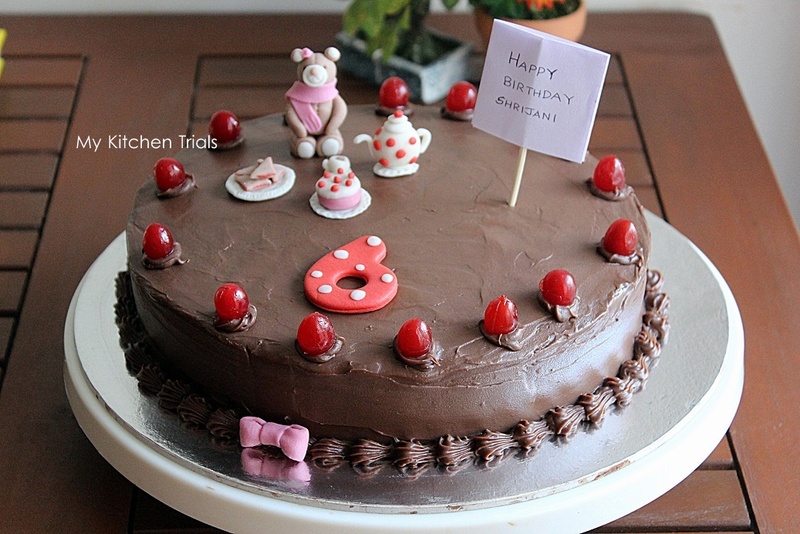 Take out the cake and attach it to the cake board using a bit of ganache. I find a turn table very convenient for decorating. Transfer the cake to the turn table and cut it into two pieces carefully. Keep the top layer aside in a plate. Whip the ganache up to get a smooth texture and apply some of it as the filling, leaving a border all around. Else when you keep the top layer, the filling will squash. Once you have filled the cake, place the top layer of the cake back in place. Crumb coat the cake with ganache on all sides and leave it in the fridge for 20-30 minutes. Take out and the coat again with ganache all over. Pipe designs around and decorate as you like. 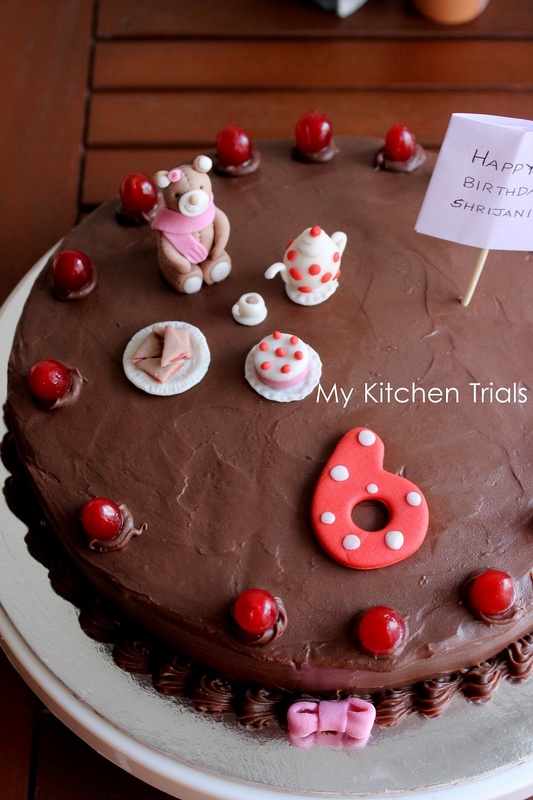 I placed the fondant toppers on the cake and kept the birthday message as well. For step by step tutorial for making teddy bear, check this link. Check here for tea pot tutorial and here for mini party food tutorial. That’s a very pretty cake, with adorable little fondant toppers!! Congrats on your first order, wish you many more. what a cake! the fondant toppers are very cute! Awesome one Rajani, very well done and so special too..I am sure kids loved it! So cute! Perfect for a birthday. Congratulations on your first order too! 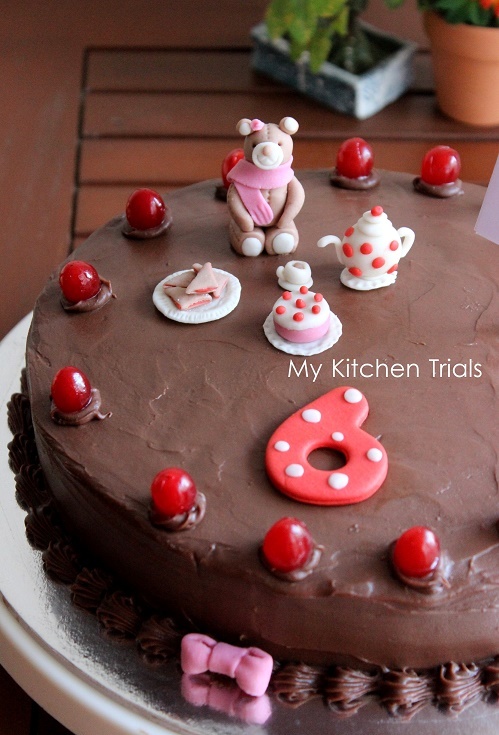 I would like to thank you for sharing your sweet and simple recipes.. Kids love your recipes.. & cakes, Common middle-class family can afford this.